I back too many Kickstarters. Or, I did for a spell, at least. I've since scaled back quite a bit after a few too many board games arrived, often a year or so later than promised, and then have sat unopened on my shelves. 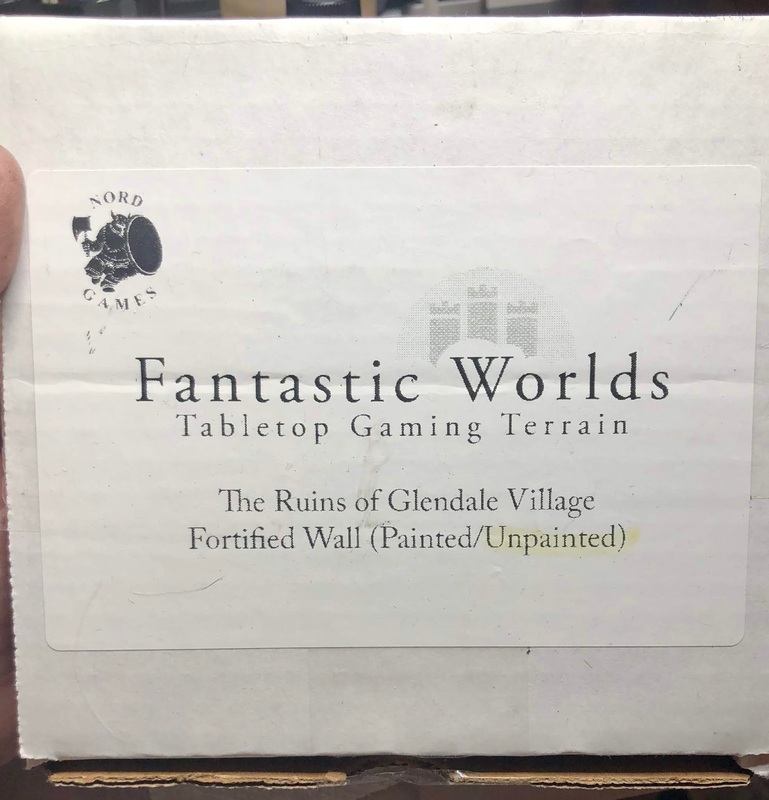 One Kickstarter I am glad I backed, however, is Nord Games' Ruins of Glendale Village. 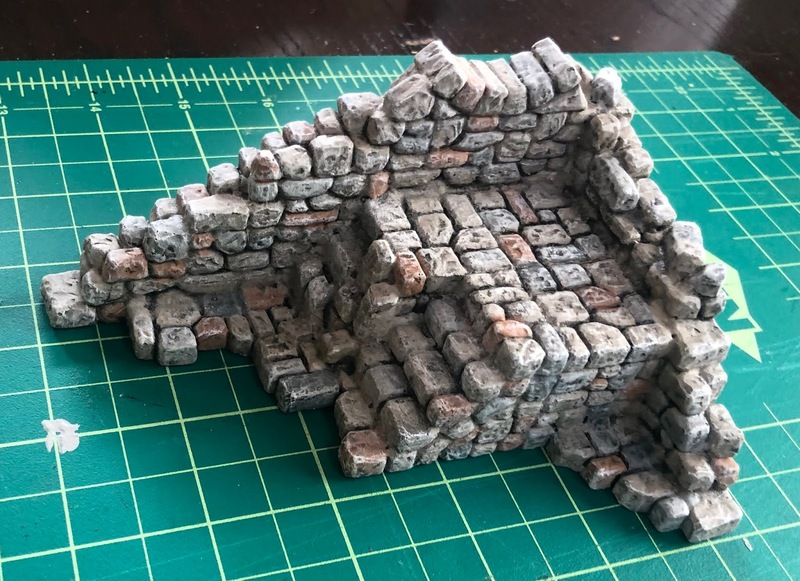 I backed it before getting a 3D printer for my birthday last year, but I think I'd still back it today, given the high quality of the pieces and very reasonable price. 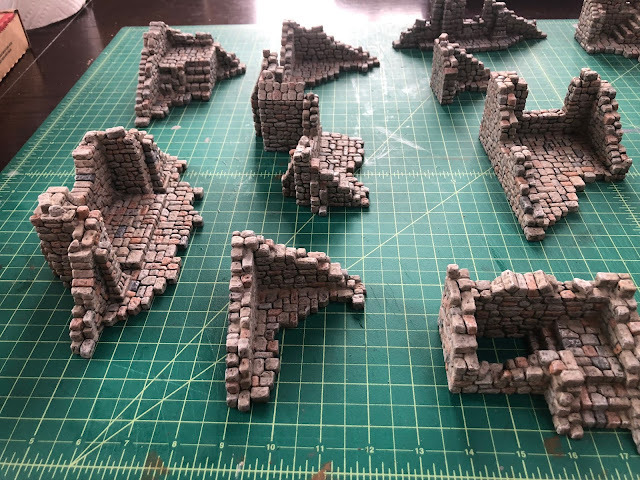 I opted for their "Journeymen" pledge level, which netted me two hefty four-piece unpainted sets of scatter terrain ("Set 1: Shacks & Guard Tower" and "Set 2: Abandoned Church"), and I supplemented those with three or four of their add-on pieces. The pre-painted versions pictured on their Kickstarter page looked fine, but not better than anything I felt I could easily accomplish on my own, and so decided I'd rather stretch my dollar by picking up more pieces and putting in the sweat equity of painting them myself. Also, I knew if I painted them, they would have a better chance of matching my existing pieces. 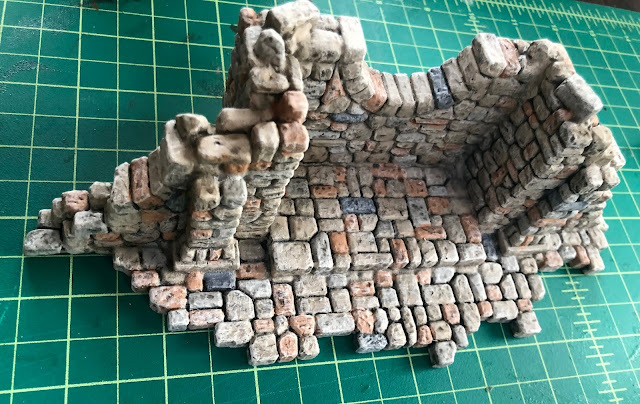 It seems the folks at Nord Games licensed some Hirst Arts molds, crafted nifty ruins, and then cast them in a special plaster called Merlin's Magic. 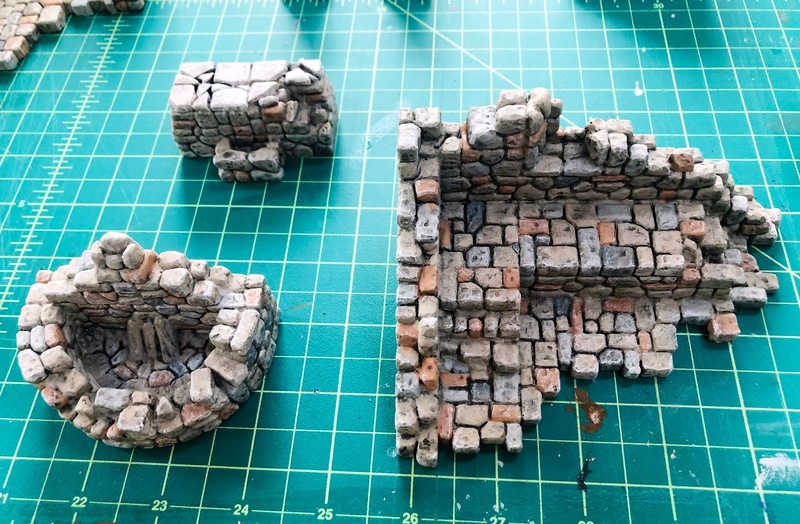 My pieces were extremely well packaged, yet somehow one of the longer ruins still broke in transit. The funny thing is that I easily glued in back together, and I literally can't discern which piece it was that broke. 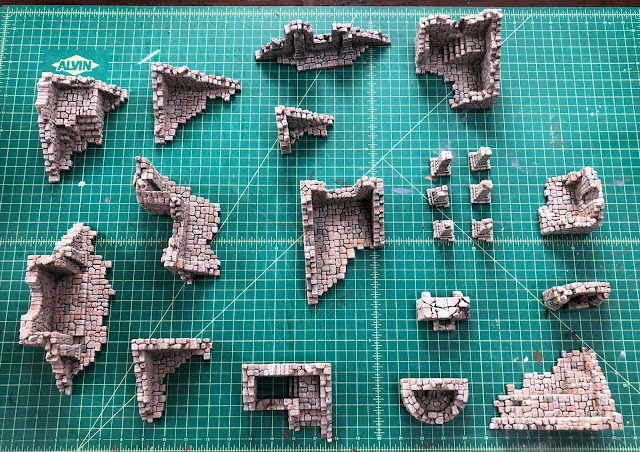 All of the the pieces have a really nice heft to them, and I've already knocked them into one another a few times while prepping and painting them with no damage, so they don't seem particularly brittle. 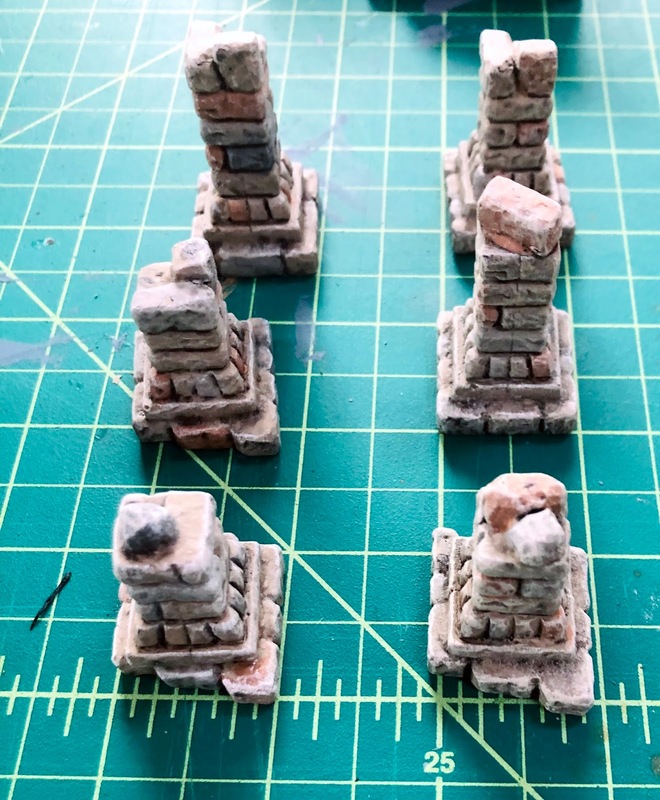 I started out priming these by brushing on black gesso, but it was taking too long and abandoned the approach for a simple black spray primer, which worked out fine. I consulted a couple of Black Magic Craft (BMC) videos on YouTube to guide me through the painting process, one of which made me reconsider my original approach to how I was going to paint these ruins. 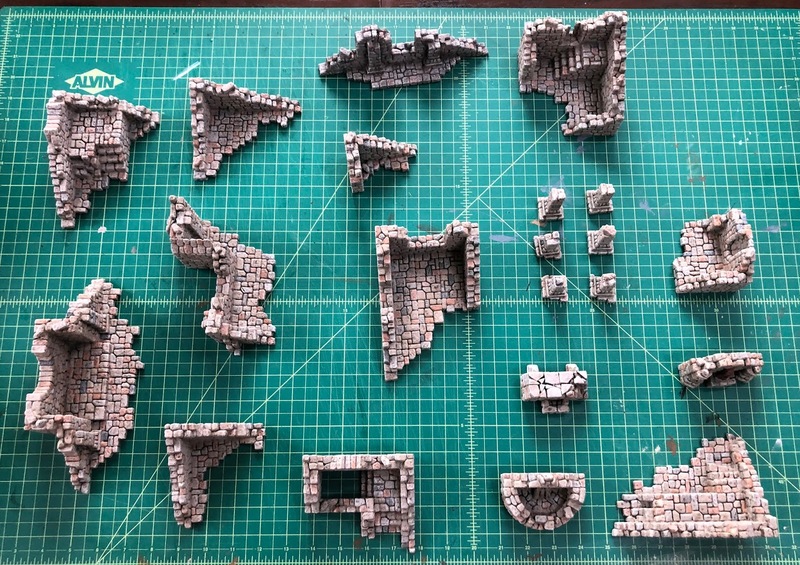 I bought these pieces assuming that I'd go with my oft-used three shades of grey (a base coat and two rounds of drybrushing). 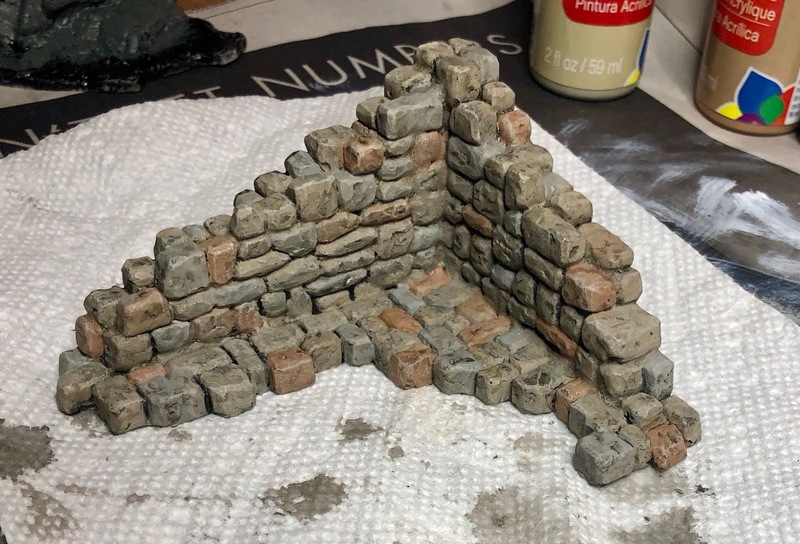 But the recent tutorial on improving the look of stone work by picking out some bricks in different colors caught my attention, and this seemed like a small enough project to make it worth trying. I took some notes while watching "Better Stone Painting" (episode 109), and I coincidentally already had most of the exact Craftsmart paints he uses in the tutorial (I picked up the couple I still needed from Michael's). It's a solid set of colors to work with, but I found after taking a few pieces through the entire painting process that the Craftsmart Grey didn't really have enough contrast after the washing step in the process, and was hardly, if at all, noticeable in the end. So for the final several pieces I added a darker grey, Craftsmart Graphite, which was much better, and became suitably subdued and blended with the rest during the drybrushing stage. I definitely departed from the BMC tutorial in two significant ways. I had never tried drybrushing before applying washes, as he does in his tutorial, and so I gave it a go on the first couple of pieces. 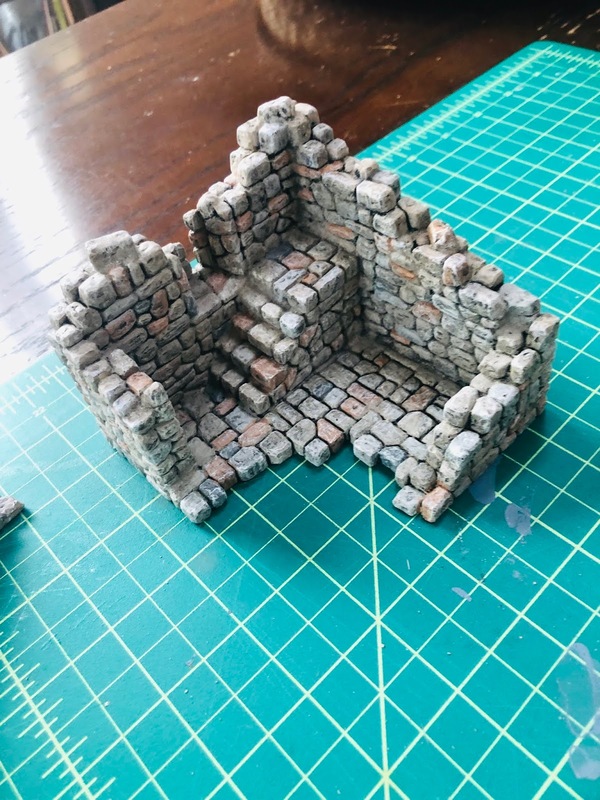 I think it's a mistake, and I still far prefer saving drybrushing as the last step of the process; applying the wash last seems to essentially obliterate the drybrushing in my experience with these ruins (and in general). Less significantly, I also abandoned his idea of adding brown or green washes in spots. 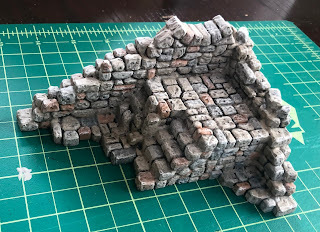 I tried it on the first couple of pieces, but I don't think it added anything to the overall effect, and may have even muddied things up a bit more than I would like. 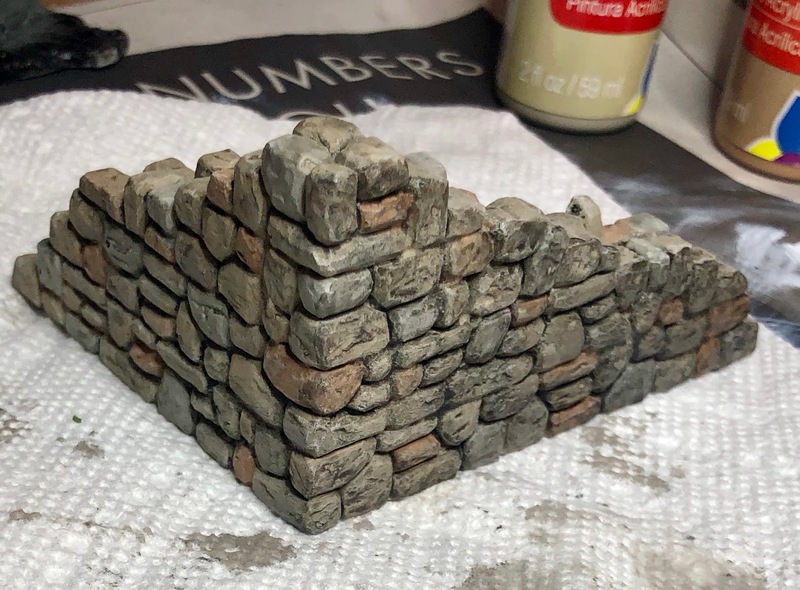 The other BMC tutorial I benefited from was "How to Make a Better Black Wash for Terrain" (episode 105). I had purchased all of the ingredients he uses from Amazon, and put together my own batches of black and brown wash. 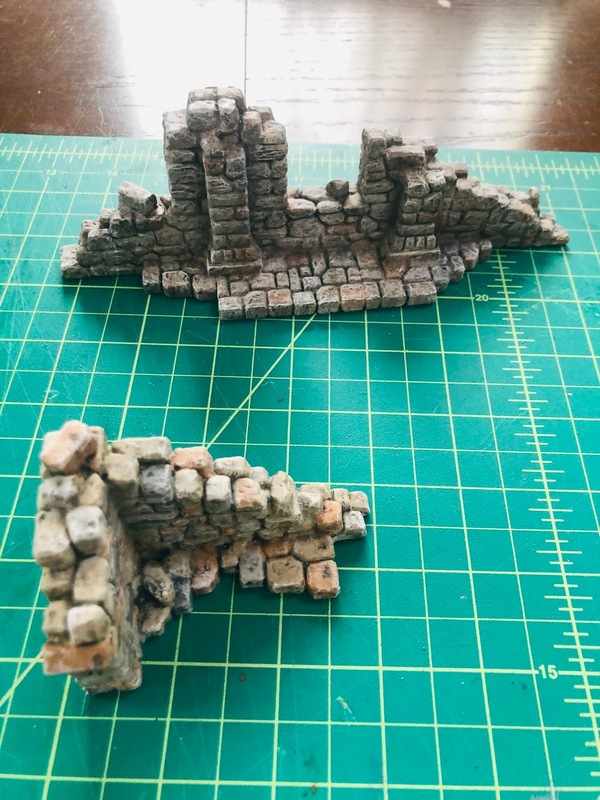 I actually liked the results of these homebrewed washes better than Army Painter's "Strong Wash" or "Dark Tone," both of which I tried on the first couple of pieces in this project. 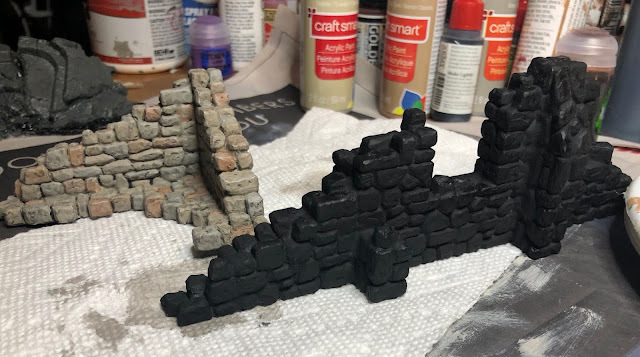 I ultimately just used the homebrewed black wash, and I was glad I made it myself, because I used quite a lot of it (probably the equivalent of three or four bottles worth if I had bought and used the equivalent in Army Painter washes). I would have to experiment a bit more before using this homebrew wash on actual figures, but for terrain it works great. And buying the raw ingredients means I have enough to make many more batches, enough perhaps to gift to my game crafting buddies (of which I've acquire a few now). Below are some photos I snapped. I wish I had taken more "process" photos as I went along, but most of these are snapped after I had completed the whole project. Click on any of them to enlarge. Experimenting with washes here. The right side was a lot heavier and darker than I wanted. This piece was done several weeks ago (it took a while before I could carve out the time to turn my attention back to the remaining pieces), but I think the right side was done using the Army Painter "Dark Tone." I'm ultimately happy with how these turned out. I didn't have much in the way of ruins in my scatter terrain collection, and this was a satisfying way to remedy that in one fell swoop. If anything, I was so pleased with the results that I logged back online to see if I could pick up any of the other sets, but I can't find these listed on the Nord Games site anywhere. 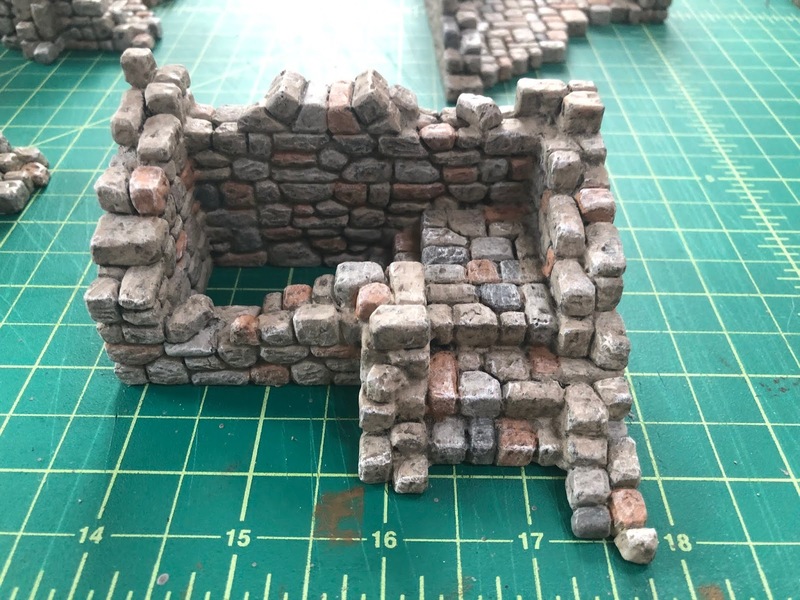 They've since gone on to launch several other Kickstarters, but it's looking like their excursion into making cool miniatures gaming pieces like this may end up being a one-off, which would be a shame. I will say that once again I seem to perennially misjudge how long these projects will take me. Maybe it's simple inexperience, and I'll get faster with time, but I sat down to crank this out in a Saturday afternoon, and the whole thing stretched into a few evenings in the following week to get to the other side of. 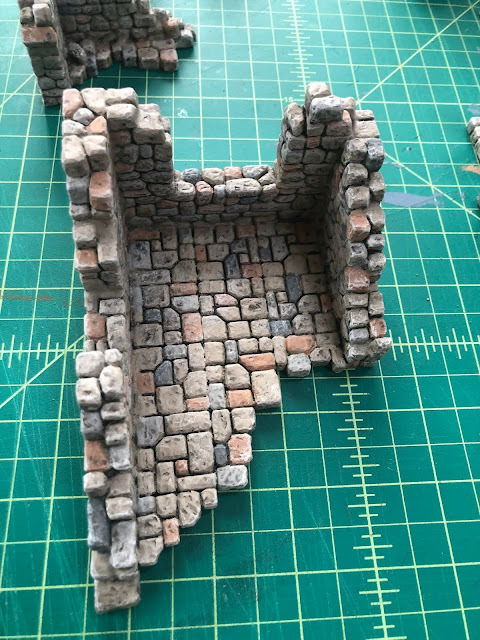 Deciding to add a fourth brick color (graphite) to the mix certainly added to the time spent, but I also feel like other crafters crank this stuff out faster than I can. 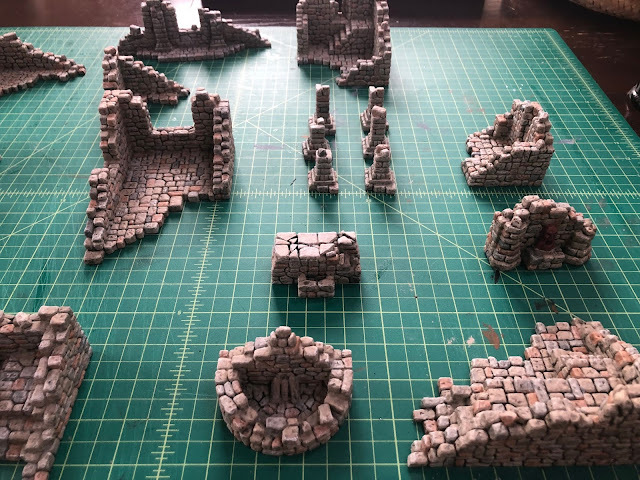 Now I just need to get a game of Frostgrave or Sellswords & Spellslingers on the table and fight some skirmishes among the ruins. Alas, that will not happen for at a least a few weeks as I push everything along with my compatriots in the Second Saturday Scrum Club as we march toward launching Scrum Con 2019 in a little over two weeks! Hope some of you will consider joining us here in the Washington, DC area for our first little game convention! You know this is one of my fave songs off one of my fave albums! The variation in color looks very good. 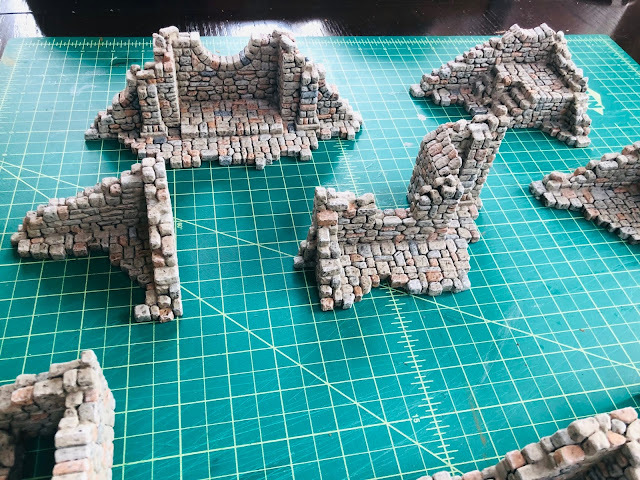 Lovely looking ruins,I like the line painting stone episode 109! Some readers may recall that I attended my first game convention, a late bloomer at 47 years old, by making the trek to Historicon 2017. It was a wonderful experience for me, and I left the weekend with a heady enthusiasm for this hobby I'd only recently discovered. This year's Historicon marked another first for me: Crafting and running my own convention game. Back in December I recruited some friends and new acquaintances I had connected with in the D.C. metro area to establish a monthly game group, the Second Saturday Scrum Club. Every month we meet in my dining room and somebody sets up a miniatures game for us to play. In late spring we gathered to try a new set of intriguing rules by Ganesha Games' Andrea Sfiligoi, Sellswords & Spellslingers. They were a hit with the group, and the next day Steve Braun offhandedly mentioned how perfect they would be for running a scenario based around Robert E. Howard's classic Conan yarn, "Beyond the Black River." Our most recent gathering of the Second Saturday Scrum Club (which meets once a month for friendly fights across my dining room table) was devoted to playtesting the scenarios for Sellswords & Spellslingers I plan on running at Historicon in July. After our earlier club game with this system, Steve Braun smartly observed how the game is almost perfectly tailored for running a scenario based on the Robert E. Howard's "Beyond the Black River" in which Conan and his companions spend nearly the entire story attempting to evade the rampaging Pictish hordes in the wilderlands that the Aquilonian empire is struggling to colonize. As I've mentioned plenty of times since starting this blog, I'm new to the whole tabletop miniatures gaming hobby. I am having a blast, and it has become something of a consuming pastime, sometimes scarily crowding out my interest in other things that might have once captured my imagination and arrested my attention. So it stands to follow then that I decided I should go today to check out the biggest miniatures gaming convention in the Washington, D.C. area, NOVA Open. I liked the backstory of how the convention started as a big BBQ in a local fella's backyard, drawing about 32 players for an afternoon of fun back in 2009. It smacked of just the kind of community-building inspirational success story that's hard not to like. Unfortunately, that homegrown spirit and sense of fun wasn't in much evidence today as I roamed around the Hyatt Regency in Crystal City, Virginia (just across the Potomac River from D.C.). Around the time I entered college in the late 1980s, my up-to-then lifelong gaming pals dispersed geographically, and if we did cross paths again (some of us didn't), our time was usually spent in Olympian bouts of drinking, smoking, and trying to impress young women (sometimes successfully if transiently, more often in vain). Playing euchre, a card game that meshed better with drinking and smoking all night, became the default gaming pastime in college instead of role playing games. I've always enjoyed a good competitive match as much as the next guy, whether it was sports in high school or video games (HALO, etc.) in my thirties. But regardless of the game, I've always been partial to team play, and the best cooperative games put all of the focus on succeeding as a team. That's one of the reasons I was enthusiastic about getting Andrea Sfiligoi's latest release, Sellswords & Spellslingers (Ganesha Games), on the table for this month's Second Saturday Scrum Club gathering. My wife's hobby is photography. She has a great eye, and she is passionate about good photography and photographers the way I am about the great illustration and illustrators of yesteryear (see my press Lost Art Books for more). I long ago gave up taking photos of anything on vacation when she and I are together. One only has to take a photo of the exact same point of interest enough times and see how superior your wife's turn out in terms of composition, dynamism, color, and "feel" before you realize it's best to leave such business in her far more capable hands.